Known to produce a range of innovative supplements Rule 1 has introduced their high calorie mass gainer, LBS specially formulated for hard gainers. Rule 1 believe what you put into it is what you get out of it when it comes to bodybuilding and nutrition which is why they have created a clean and all rounded high calorie weight gainer designed to put on muscle instead of pure bulk. If you’re someone that struggles to gain weight and add mass, Rule 1’s LBS may be an alternative for you. The benefits lie in their formulation including a ratio of 5:1 carb to protein ratio for a faster metabolism and for quicker weight gain. It is made up of a combination of an effective calorie dense carbohydrate stack that includes low glycemic carbs like organic rice bran, glucose polymers, and pea starch to keep you feeling fuller as well as keeping you fuelled during your workout. While much of the bodybuilding nutrition industry focuses on muscle-building protein and similar supplements, carbohydrates should still be a majority of your diet if you want to increase your size and muscle definition. 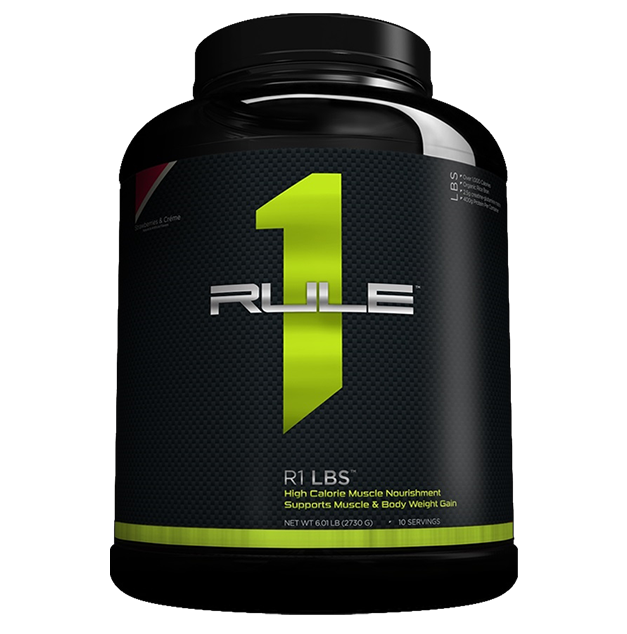 Rule 1 provides an excellent carbohydrate blend for maximum performance in the gym. Better yet, it also includes a pure whey protein blend that has been ultra filtered making it the fastest and purest form of protein available. To help stimulate protein synthesis, R1 LBS has an additional 8g of BCAAs to minimise muscle tissue breakdown and support muscle growth. Additionally, including a high dose of creatine and glutamine in the blend also allows better muscle endurance and also helps to aid with recovery. While there’s nothing wrong with taking mass gainer supplements they may not work for everyone. This is not to say R1 LBS is a bad product because when you’re trying to build muscle, you need to get more calories in your diet depending on your age and gender. Some may argue that having creatine in mass gainers can pose a negative effect due to the water retention associated with creatine supplementation, but in this writers opinion the inclusion of creatine is a benefit, aiding is muscle strength and mass, creatine also as we know has been scientifically shown to be safe. The flavours of LBS are available in both Choc Fudge and Vanilla. For a more milkshake consistency add to milk or add some ice for a more malt-like texture. It mixes perfectly like the rest of the other Rule 1 supplements on the market. If you’re looking for a high calorie gainer designed to put on muscle instead of bulk (fat), you want to get your hands on Rule 1 LBS. The formula is all rounded and covers all the essential nutrients you need to help maximise your bulking phase.